Is Recorded Music Okay for Children? Y NOSE HAS BEEN buried in Sing to the Lord lately as part of a research project on which I am working. 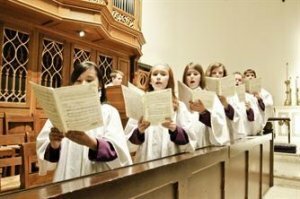 In 2007, the USCCB promulgated Sing to the Lord: Music in Divine Worship (SttL) as a replacement for the twin documents, Music in Catholic Worship and Liturgical Music Today. To say that the new document is an improvement would be an understatement, but it is not an ideal text, either. Two weeks ago, speaking about the Children’s Liturgy of the Word, I took issue with the prevalent notion that young people somehow need to be accommodated in the work of divine worship. As a former child, I find this to be an errant hankering—a perspective that is often well-intentioned, but fundamentally condescending and lacking in foresight. True, St. Paul advises feeding first with fluids, preparing the way for solid food (1 Corinthians 3:2). But the admonition is to serve milk (real food), not plastic fruit. Having just acknowledged that canned music “lacks the authenticity” required by the sacred liturgy, why is a caveat provided for “Masses with children”? Are children not worthy of the best forms of liturgy? Having just rightly identified the inappropriateness of recorded music, why is its “careful use” proposed as acceptable when children are in tow? These pages have demonstrated numerous times before that children respond very well to true sacred music. (For example, see this—Our Lady of the Atonement I, this—Our Lady of the Atonement II, this—Gregory the Great Academy, and this—Youth in Favor of Sacred Music.) If you have never experienced it for yourself, try it out. Children take naturally to chant, and there are so many resources available for teaching it to them. It is time to put the Glory & Praise cassette tapes away and to bust out the Ward method books. If you want to get started, I highly recommend checking out the work of Maestro Wilko Brouwers, the Words with Wings series available from CMAA. It is so much more rewarding to challenge children to chant than to settle for the crudeness (and hoakiness and banality and utility and frivolity) of recorded music. 1 Gerard Dennis Gill, Music in Catholic Liturgy: A Pastoral and Theological Companion to Sing to the Lord (Mundelein, IL: Hillenbrand Books, 2009), 29.